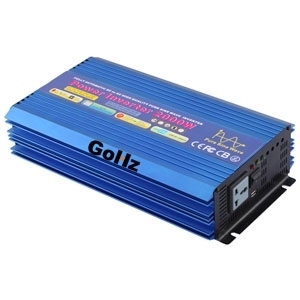 12v, 24v, 48v 2000 watt pure sine wave inverter for your RV, motor home, laptops, cellphones, battery chargers and other home devices, USB outlet is available. Tips: Can I connect a 2000w pure sine wave inverter to an adapter with 220V 50Hz power supply input to get 110V 60Hz power? In a word, NO, unless the load requirements are so small they approach no-load. Of course, it all depends on the actual power level you require from this 2000 watt sine wave inverter and the inverter's full load power capability, and whether or not it's a true sine type or a quasi-sine (aka modified sine). Generally, the pure sine wave inverter will require large DC current pulses from the battery and will need at least 1-5 amps from a lab supply or adapter, even at no-load on the power inverter.